Burns: Burns are injuries caused by the body coming in contact with a hot surface or when clothes catch fire. Scalds: Scalds are injuries caused by hot liquids or vapors. 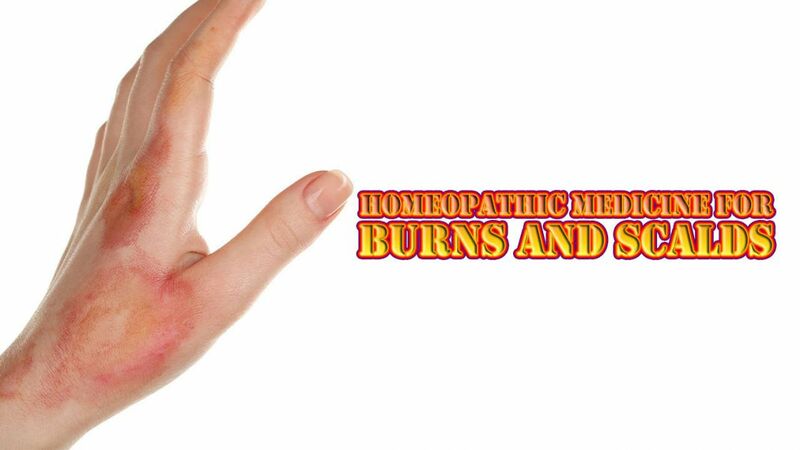 There is no remedy like Cantharis for superficial burns and scalds. It prevents blister formation and other consequences. There is much burning in the affected parts. Injured part should be immersed or bathed in a solution of Eantharis or Urtica Urens Q. (mother tincture, 25 – 30 drops of mother tincture in 1 cup of water). Cantharis or Urtica Urens mother tincture (30 – 40 drops of M. T. and 1 cup of water) to be applied as a lotion and the cloth kept wet with it, without being removed. Internally give the same remedy in 30th potency every 10 minutes. Ars. is useful when vesicles turn black, showing tendency to gangrene. If given, it prevents, gangrene, when it is indicated. It is useful when tongue gets burnt due to drinking hot tea or eating hot food. If Ars. gives no relief give Causticum. Causticum is indicated in the third stage with painful vesicles. When Cantharis or Urtica urens give no relief. It is also useful when old burns that do not get well and ill-effects of burns.